After having been involved with teaching and thinking about food for over than 10 years, I am completely convinced that the art of Italian cooking is to extract flavor from food rather than adding flavor through elaboration. This is the ultimate discovery of modern Italian cuisine. Not the foams, not the rare ingredients, not the fancy presentations. That’s culinary school stuff and to me it rarely has something to do with real food. With time I have realized that to take something very simple like a vegetable, or a piece of meat or fish or a package of flour and bring out its original flavor is difficult. It can only be done with excellent ingredients and to obtain that you need to constantly research and evaluate the quality of what you are using. Obtaining good ingredients for everything you cook is a form of inner discipline and not always obvious or easy. But why is it so worth it? We humans love food not only as a form of sustenance but also because of its chemical complexity which stimulates the brain and induces pleasure. The more you have something fresh, grown in a natural way and not treated with chemicals or long refrigeration the more fragrant and complex the original taste of the food will be. As a consequence you hardly need to do anything to it except a minimal manipulation to bring out and enjoy its native flavor. This recipe is an example of what I mentioned above. It will be heavenly if you have wild mushrooms. And even with the cultivated ones, it will only work with fresh mushrooms and herbs and really good olive oil. There is not much else in it after all. 350 gr (12 oz) fresh whole mushrooms, cleaned. Preheat oven at 180°C (360°F). For this recipe you need to have fairly large pieces to retain the meaty texture of the mushroom. Thin slices will basically boil in their own moisture and as a result will be gummy or stringy. Whole oyster mushrooms and small chanterelle will need no slicing. If you use large portobello or porcini it’s better to slice them in half or quarter by the length. Cut four 20×20 cm (8×8 inch) pieces of parchment paper or prepare 4 small oven bags. 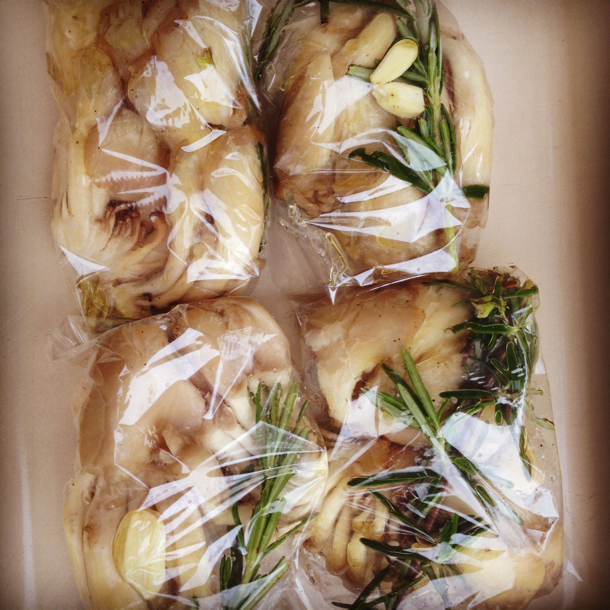 Arrange 1/4 of the mushrooms on the paper together with a sprig of rosemary and one garlic clove. Add a slice of pancetta if using. Season mushrooms with salt and pepper, drizzle with one teaspoon extra virgin olive oil, 1/2 tablespoon white wine, then seal the paper parcel or oven bag and transfer in an oven tin. Bake for 20 min and serve warm directly in the parcels. You can also serve them at room temperature in which case remove the parcels and transfer into a dish. Drizzle with good extra virgin olive oil just before serving. PS. I am not at all opposed to cooking the parcels on the BBQ. In this case I’d use foil, not plastic or paper. “En papillote (French for “in parchment”), or al cartoccio in Italian, is a method of cooking in which the food is put into a folded pouch or parcel and then baked. The parcel is typically made from folded parchement paper but other material, such as a paper bag or aluminum foil may be used. The parcel holds in moisture to steam the food. The pocket is created by overlapping circles of aluminum foil and parchment paper and then folding them tightly around the food to create a seal. A papillote should be opened at the table to allow people to smell the aroma when it opens”. Yes, I agree wholeheartedly with this view of food, and would apply it to most cuisines, not just Italian. the foams and fiddly presentations are faddish and will soon be replaced with some other vogueish thing. to arrive at those true flavours. That is why I grow my own arugula and as many tomatoes as I can squeeze into my backyard in Canada. thank you Bronwen, I think things are improving in North America compared to 10 years ago. When I lived in Texas 20 years ago it was hardly possible to find a good piece of cheese outside the big cities and now I hear people can buy all sort of things previously unavailable. We are priviledged as we have very good stuff here, but still one has to look carefully for specific ingredients, industrial food is everywhere and it’s bad. There si always space for improvement, everywhere! yes thsi is true not only in North America but also in urban Italy. However Frank from the mouthwatering recipes I see from your blog I am sure you can find and know very well how to use your ingredients ! Just made this last night and I wonder why I made mushrooms any other way. So delicious and easy to cook. so glad you enjoy it Rebecca!